Major Cure for Disaffected Teens – Tell the Truth! In the last newsletter I wrote about authenticity, and the critical role it plays in the well-being of youth. I wanted to make the point that guiding kids toward authentic self-discovery is powerful energy that creates closeness and personal momentum. These ideas struck a chord with many as measured by e-mails, phone calls, and invitations to address students on this topic. Thanks to all! Reflecting on these conversations over the last couple of months, it seems worthwhile to dig a little deeper. I would like to say more about how authenticity emerges in young people’s lives, including how it is manifest in day-to-day conversations and decisions. I don’t think of authenticity as a strategy for curing boredom or lethargy, but I certainly believe that the sort of “truth telling” that goes hand-in-hand with authenticity is a major antidote to distraction, not to mention the existential malaise commonly referred to as boredom. Most of us think of authenticity as a state of being where we are being true to ourselves and the various choices that we make: how to spend our time, what we say, the goals we establish, what we stand for. I agree with these ideas, but I think it’s important to emphasize that drilling down for the truth is the primary mechanism by which we arrive at those destinations. So often in life we focus on the content of what we are doing or saying, more than we do the form. Yet it is the form that stays with us and defines us. In this way, authenticity is powerfully communicated by the tonal aspects of our speech. This includes being thoughtful and measured in how we say things, and making double sure that we have been understood correctly. If you decide to work on this initiative within your own family, take comfort. Like other change processes, you don’t have to complete the goal to start feeling better. As soon as you begin working hard to drill down for the truth, you will feel as though you are getting right with yourself. The feelings of self-determination and hope that follow are indications that authenticity taking root. 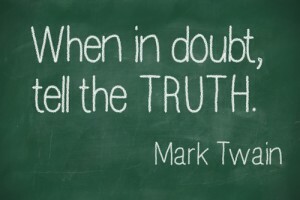 Sometimes I see this in my office when I push kids to give me more truthful answers. This is especially the case when they are sitting next to a parent, and may feel some pressure to say what they think their parent wants them to say. To challenge that reflex is to emancipate a young person. The main point is that it’s less important to say the right thing, than it is to say what one truly thinks. That’s the real measure of progress in psychotherapy. It’s not what young people assume they are supposed to do – and that’s why many resent be dragged into counseling. Now, there’s no doubt that some kids say things simply to get adults off their back. That’s the opposite of authenticity, and is in most cases an expression of disrespect for the process itself. The hardest thing to learn – to believe – for young people who are inclined in this way, is that others can be open to their genuine thoughts. I’ve been reflecting on the nuances and difficulties of this process for many years, and I’ve tried different approaches, some more successful than others. For sure, it’s not a one-size fits all deal. Different kids respond to different kinds of words, and different energies. One thing that seems to work for a majority, however, is to model the authenticity I hope will emerge in the child. A good start is to uncover differences of opinion among adults. Sometimes that can be the contrast between parents’ perspectives, or possibly the attitudinal differences between a parent and therapist. It might also mean a frank discussion about teachers or school limitations. The subtext: adulthood is not the monolithic tower of agreement about right and wrong that many kids assume. Think about how different this approach is than what is typically thought of as “counseling.” In my own mind,”counseling,” as the term is used in popular culture, has become void of any depth or potential for transformation. Counseling is mostly described as an activity in which you vent your feelings, so that you can magically feel more calm, and thus easier to manage for adults, schools, or other cultural power centers. Therapists who support this idea of counseling by focusing intervention on good behavior will almost certainly alienate kids. None but the most over-identified with parents would accept such a process is authentic or relevant to themselves. Some years ago, when psychotherapy was more widely practiced as an exploration of human depth, and with respect for personal narrative, professionals spoke of therapy as being a “corrective emotional experience.” I unabashedly love this term. I believe that is precisely what the best psychotherapy accomplishes. When kids have behavioral problems, from aggression to substance abuse, it is a huge mistake to adopt a focus that is so molecular that it excludes regard for the whole person in whom this problem lives. We work to stop problem behaviors only when the behavior no longer serves a bigger idea about who we are, or want to be. I’m emphatic about authenticity because it embodies a seriousness and depth of connection that transcends bubblehead. When we speak the truth, when we allow our heart to come forward, we immediately create tension and attention. We draw others toward us. We invite them to experiment with leaving their own mental orbit, and join our own. This is more than a perception – it’s real! You can see it and feel it. It’s the quiet that surrounds an interaction; it’s the directness of focus in the eyes, it’s the clarity of thought that emerges when the heartfelt truth is allowed to unfold. This might be the truth of different people’s perspectives, or it might be frank insight about why a person is doing a particular thing. It might be a revelation about the deeper agenda that shapes a pattern of behavior. In my work, it must involve drilling down for the truth of a person’s psychology. This is different than coming clean about your behavior over the last week. That also might be important, but it’s not as important as the psychology that defines one’s personhood. This form of connecting with young people is more important than a reasoned discussion about good choices, or elaborate explanations about morals and responsibility. And by the way, when we drill down for the truth in this way, it is always helpful to adopt a position of greater humility. Focus more on how to interpret and nurture your child’s truth, than how to control it. That gesture is itself incredibly welcoming. You may be thinking this approach has great relevance for the most committed participants in psychotherapy, or the most intellectual kids in school. But my experience is that it matters for almost every young person, although it has to be communicated with different kinds of words, and with different tempos. When we focus on tone (form) more than content, we are emphasizing the primary role of connecting. I believe that feels like an abdication of responsibility to some adults. Yet I also see that the next generation has different expectations about their relationships with adults. I feel as though there is a major gap between the ethos that shaped the youth of those who grew up in the late 20th century, and those growing up in the 21st century. Contemporary youth want a more collegial and mutually respectful relationship with parents. How can we possibly connect with the current generation unless we’re able to harness the form of our communication? Readers of this newsletter know that much of my professional work has focused on the challenges of school-age boys. One thing I’ve learned from this work is that the complexities of becoming an adult are more complex than the rules of childhood. Let me say this clearly:it is much more difficult to figure out how to be a good man in the world, than it is to figure out how to be a “good boy.”[Certainly, the equivalent can be said of girls, though the terms of maturity may be different.] 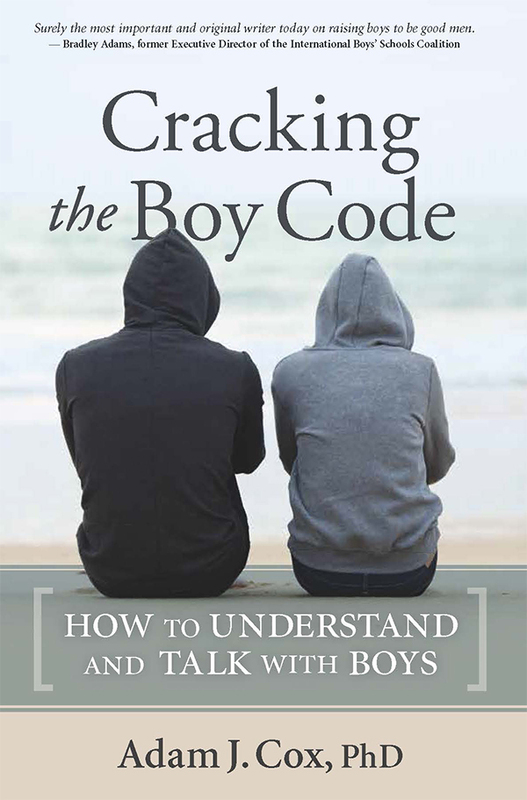 Yet the vast majority of therapies and interventions provided to youth are fixated on how to create good boys. If you contemplate that idea for just a minute you will get a feel for the power of mindset. I hope you will also get a feel for how essential it is to lead boys, rather than change them. That basic distinction is the key to everything else. It’s the difference between connecting and conquering. Just do it. Our own authenticity is measured by how well our actions match our words and feelings. My life is made up of conversations, and I have surely failed more times than you [imagine smiling emoticon]. Yet I’m asking you to stick with me, and speak with others about these ideas. I’ve been writing this newsletter for a decade, and it now has thousands of readers. Still, our collective energy barely scratches the surface of where we need to go. I am deeply grateful for the time you periodically give these essays, and I warmly thank you for your comments, insights, and stories. We have more in common than I ever realized. The shape of our community is round, stretching across continents and oceans, encompassing all who find purpose in making the world a more welcoming place for youth. Thank you for teaching me that “community” is more than descriptive – it’s a reason to keep talking. On Purpose Before Twenty is published by Four Corners Press and can be purchased worldwide.